The Blade mCX ('micro CX') comes from E-flite, and brings the well known Blade CX name into the 'must have' category once again! 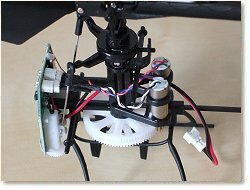 The helicopter is a coaxial rc helicopter, also called contra-rotating or dual rotor. E-flite are no strangers to RTF coaxial rc helicopters, they've seen enormous success with their Blade CX2, the first RTF rc aircraft to be sold with the 2.4GHz spread spectrum based rc technology, now commonplace of course. The obvious difference with the Blade mCX is its size. As the photo shows, this helicopter can sit comfortably on the palm of your hand, has a rotor span of just 7.5 inches and weighs in at a mere 1oz (28g). 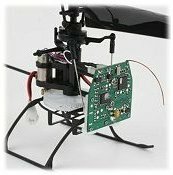 It's no surprise that E-flite have developed an RTF electric rc helicopter of this micro size; electronic components for radio control aircraft have been getting smaller and smaller over the years and that's been great news for the hobby. 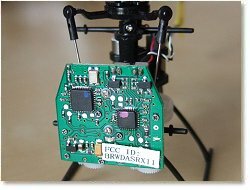 A fully controllable rc helicopter that could be flown safely around the home was just a dream when I was a kid, but the massive global electronic revolution and the popularity of the rc hobby has made micro rc helicopters a reality. Such tiny electronics are commonplace in radio control aircraft these days and the mCX boasts a 5 in 1 control unit that holds the Spektrum 2.4GHz DSM2 compatible receiver, twin motor electronic speed controls, mixer, gyro and fully proportional servo motors coupled to feedback potentiometers. In fact, these innovative little components were developed and used in ParkZone's Ember and Vapor ultra light rc airplanes. 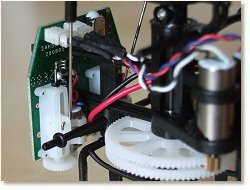 They do away with the need for bulky and heavy servo casings and work like any proportional servo. Impressive! 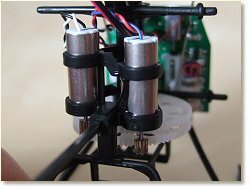 Twin micro coreless motors power the two main rotors and the tiny 110mAh Li-Po battery pack gives adequate flight times. 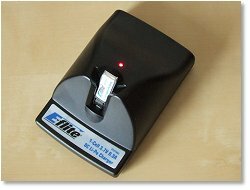 The battery is marginally smaller than a Flash memory stick and is charged with the supplied charger, powered by 4 'AA' size batteries. 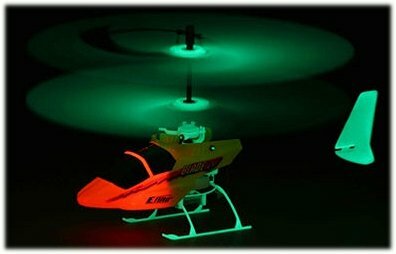 As with all coaxial rc helicopters, the E-flite Blade mCX is inherently very stable, much more so than a conventional single rotor helicopter. 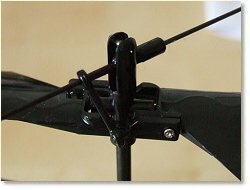 Each main rotor spins in the opposite direction to the other thus cancelling out the natural torque that necessitates a tail rotor on a conventional helicopter. 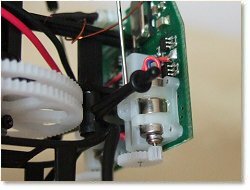 Because there is no tail rotor on a coaxial rc helicopter, yaw is controlled by adjusting the speed of the main rotors. 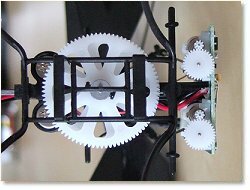 By making them turn at different speeds relative to each other, torque is purposely introduced thus turning the helicopter in the desired direction. As you can see, the helicopter is stable enough to hover without any input at the transmitter. This is possible with the necessary replacement parts that have been coated in a luminous paint, and is a cool feature that's sure to help it sell well. 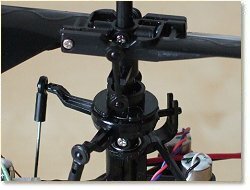 100% factory assembled, test flown and fully RTF. 4 channel 2.4GHz Spektrum radio, with digital trims and dual rates. 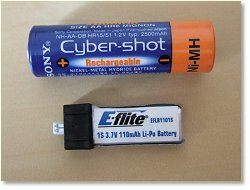 Battery: 1S 3.7V 110mAh Li-Po. 'Desk top' Li-Po charger included. Overall the Blade mCX is a very impressive little micro helicopter with very friendly flight characteristics. Easily flown around the home, I'd recommend one to any rc pilot regardless of experience levels. Even for the veteran flyer, it's a great fun way of getting in some stick time!